Archbishop Seraphim will be visiting St. Vladimir’s and the Hermitage of the Annunciation from Nov 29 to Dec 4, 2007. Personal appointments with Vladyka Seraphim are available on Friday afternoon from 1:30 — 3:30 (Nov 30) and Saturday afternoon from 2 — 4 (Dec 1). If you would like to have an appointment, please sign your name on the sign-up sheet in the Synaxis Room. There is a parish potluck dinner with Vladyka Seraphim at Saturday night after Vespers which is at 5:00 pm (Dec 1). The potluck dinner will be held at the home of Cindy and Jon Goossen. Sunday Dec 2 is Divine Liturgy followed by a potluck light lunch and fellowship with Vladyka Seraphim. Contributions to the Potluck dinner would be greatly appreciated. There is a sign-up sheet for that also. Please note that Archbishop Seraphim follows a special diet and you can find information about it posted on the bulletin board. Nov 18, 2007: at the Liturgy, Father Vladimir made the announcement that the renovation and painting, under the leadership of Cindy Goossen and Luke Pitman, and all those who came to help, have been completed. Everyone agrees that the result is amazing! Fr. Roman will celebrate the Divine Liturgy Sunday September 23 at 10:00 AM. Following the Liturgy there is send-off for Peter Efthymiadis, who is going to study at the Orthodox Institute in Cambridge, England. Your contributions of sandwiches, desserts, beverages are greatly appreciated. September 9, 2007, after the Liturgy. Aaron and Krystle will be leaving us at the end of August for Ottawa. You are invited to two gatherings where we will recognize and express our gratitude to them for their service to our parish over the past years. After the Typika service on Sunday, August 26, you are invited to Jon and Cindy Goossen’s home (34 Kirtland Court, Dartmouth) for an informal social gathering over lunch. Following the Vesperal Liturgy for the Dormition of the Theotokos on Monday evening, August 27, a more formal presentation will be made to Aaron and Krystle. For both these occasions, your contributions of various dishes and desserts would be greatly appreciated. We hope to see as many people as possible for these events. Our parish picnic will be held rain or shine on July 28 at the home of Father Vladimir near Bridgewater. Bring your friends, too! All are welcome. 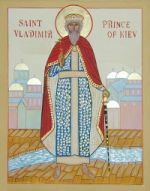 There will be a chrismation at 10:00 am followed by the Divine Liturgy at about 10:30 am in celebration of the Feast of St.Vladimir, our patron saint. Following the Liturgy is our annual picnic. If you need a ride, please contact Leslee. This is a potluck picnic, so any contribution you can make would be greatly appreciated. On Sunday, July 29, Father Vladimir will be serving Divine Liturgy at St.Antonios at 10:00 am (corner of Chebucto and Windsor). We will be doing on Saturday morning June 9, 2007 in conjunction with St. George’s yard sale in the parking lot. We will be asking everyone to bring whatever things that they no longer use but which are still in good condition in order to sell them to raise money for our move into a new location in the future. These things are the same as those found in any yard sale — clothes, furniture, books, household items of any kind, etc. Also ask for volunteers to come forward to help on that day from 9am to 1 pm. June 2 and 3. On Saturday, June 2, after Vespers at 5:30 PM, there will be a Potluck dinner with Fr. Irénée at the home of Peter Efthymiadis, 140 Purcell’s Cove Road. Confession by appointment with Father Vladimir from Friday, March 30 until Friday, April 6. (No confessions on Great and Holy Saturday). The Paschal Dinner will be held in St. George’s Church Hall after the Paschal Liturgy. Please check the sign-up sheet in the Synaxis Room for any contribution you might be able to make.